Raphael leaves his brothers to battle the Elite and heads deeper into the complex, where he’s ambushed by four experienced ninjas. Leonardo drops his four-armed opponent and heads off to pursue his hot-headed brother. Leo arrives just in time to save Raph, who is wounded and about to be skewered. “You are a fool!” Leo screams once he’s taken out the Foot. “We will not fail!” declares Leonardo. Meanwhile, things are not going well for Donatello and Michealangelo, who are still facing two Shredder Elite and a bevy of gun-toting Foot Soldiers. Fortunately Don manages to take out both Elite with one well aimed strategy. Don and Mike are pinned down by gunfire and hiding behind some crates. Mike pulls out his shurikens and says “Make each one count!” Raphael arrives but laments the poor tactical position that his siblings are trapped in. Leonardo enters the door and emerges onto the rooftop of the building. The Shredder is there. “Leonardo… I’ve been waiting a long time.” notes the villain. The Shredder explains that, through ancient practices, the Foot were able to take the pieces of his body that were blown to bits in TMNT #1 and bring him back to life by utilizing a type of worm that learns from and grows into what it eats. These worms form a colony of cels that mutate into an individual. The Shredder Elite were the first three experiments with the worms, and on the fourth attempt, the Clan allowed the worms to feed on the Shredder, thus reincarnating him… his lust for vengeance and his hatred for the Turtles stronger than before. After explaining his return, Shredder removes his armor and stands poised for battle, two katanas in hand. Back in the dock area, Mike and Don are down to their final throwing star. As Mike launches the small projectile, he and Don spot Raphael arriving in an odd, four-armed vehicle, which scatters the Foot. On the rooftop, Leonardo and Shredder begin their monumental battle. Don asks where Leo is and Raph tells him he’s busy. Raphael then grabs a rocket launcher and fires it into a tower, releasing a torrent of deadly chemicals. The Shredder has taken the upperhand in his battle with Leonardo. Saki gets a vicious kick in that sends Leo sprawling to the ground, where he sits stunned and defeated. As Shredder prepares to deliver the killing blow, the roof splits open under the strain of the chemicals that Raph has unleashed. The damage knocks the villain off his feet, giving Leonardo the opportunity to stand. He and Shredder are now separated by the rift in the rooftop, but both charge. Cut to a dramatic double page spread, where we see Leonardo and the Shredder passing one another in mid-air. There is a hair-thin line separating Shredder’s head from his shoulders. A gigantic explosion blows a massive hole into the roof of the bank, shattering all windows and sending a huge fireball into the sky. Fade into the sewers. A figure is walking in the shadows, carrying something. 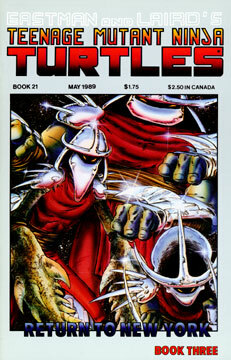 The secret doorway to the Turtles’ lair opens, revealing a mourning Mike, Don and Raph, who look up in surprise. Leo stands in the doorway, holding a body that’s wrapped in a tarp. “Oroku Saki… the Shredder… is dead.” announces Leonardo. “Our destiny is complete.” remarks Don. “Honor is restored.” Raphael states. “We have… one final task…” finishes Leo. On the final double page spread, we see the four brothers standing by the harbor. Beneath them, the body of the Shredder is burning on a floating funeral pyre.